The enamelled panels tell the story of Abraham and Isaac from the Book of Genesis in the Bible. On the lid Isaac meets Rebekah at the well. The female enameller Susanne Court has signed the lid. The casket has visible patch repairs which can be attributed to the Parisian restorer, Alfred André. Painted Limoges enamel casket; copper, rectangular with an arched top; mounted in a modern gilt metal frame on wood; made of 7 panels, showing scenes from the story of Abraham and Isaac as told in Genesis: Abraham and Abimelech feasting at Bersheba; Abraham's transactions with Abimelech at Gerar; birth of Esau and Jacob; casting forth of Hagar and Ishmael; sacrifice of Isaac; burial of Sara; Rebecca meeting Isaac; signed; painted in semi-opaque enamels over a white preparation, translucent enamels over coloured foils and chalky white grisaille with details in gilding; inscribed. Provenance: Baron Anselm von Rothschild, Vienna, between 1866 and 1872 (cat no. 477), by inheritance to his son Baron Ferdinand Rothschild (d. 1898). In Read 1902 and Dalton 1927 the casket is stated to have come from the Fountaine Collection, the same one which was mentioned in Delaborde's 'Emaux du Louvre' in 1852. However this must be incorrect as it was already in the collection of Baron Anselm von Rothschild before the Fountaine sale was held in 1884. The Fountaine provenance probably refers to another casket by Suzanne de Court now in the Metropolitan Museum (inv. no. 1980.203.2). 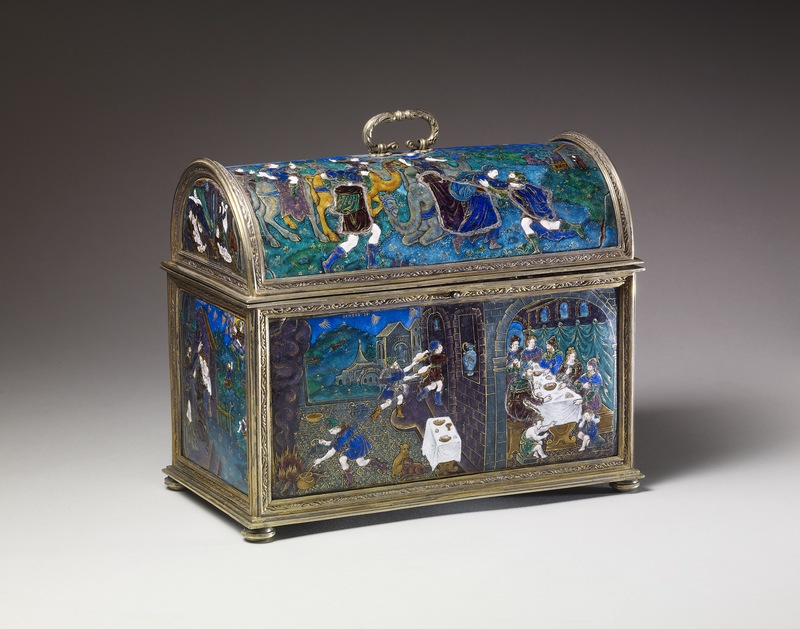 Commentary: The enamel panels in this casket are after prints by Étienne Delaune, see British Museum reg. nos. 1834,0804.76, 1834,0804.77, 1834,0804.78, 1834,0804.131, 1834,0804.132, 1834,0804.134. The scene depicting the meeting of Issac and Rebeeca is identical to that on a plate in the Louvre (inv. no. OA 4025) which is part of a set with WB.49 & WB.40 (see Baratte 2000 in bibliography). Sophie Baratte, ''Les Émaux Peints de Limoges', Musée du Louvre, Paris, 2000, p.374.